There’s something about a trawler boat that just doesn’t disappoint. You get out on that water, and can go for days without refueling, spend your day drawing through the water on the Intercostal Highway enjoying the view as you make your way up and down the canal. Those that have a trawler boat love it and when it’s in need of repair, substitutions just won’t do. If your trawler boat has been in a recent accident, and needs to be repaired, let Anchor Marine Repair help get you back on the water and fishing once again! With over 45 years of combined experience in boat repair, you better believe that our technicians have more than enough experience in repairing your trawler boat. Not sure what exactly is wrong with your boat? 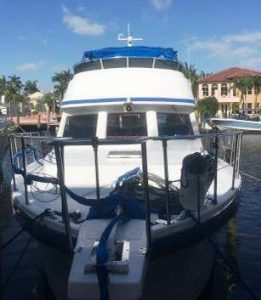 Our expert boat mechanics will examine your trawler boat and through experience and technique, we will spot and repair even the most difficult of problems. We work diligently to repair your boat and get you back on the water as quickly as possible. The relationships we have formed over the years with different boat parts companies have allowed us to find parts needed to repair your boat quickly, giving you a fast turnaround time so your fishing season can quickly resume. While our turnaround times are extremely fast, trawler boat owners are even more impressed with the quality we put into fixing your boats. We are currently rated the #1 boat repair shop in the US for boat collision repair and have no plans of giving that title away anytime soon. While most trawler boats are small, they can still be a hassle to bring to the shop if they aren’t in working condition. For this reason, Anchor Marine Repair offers pickup and delivery. Located in Delano, Minnesota…not nessassarly trawler country, but insurance companies and customers contract us to fix them all the time. We understand that boats are not simple or cheap investments. As a shop that prides itself in customer service and satisfaction, we will work directly with your insurance company so that we can give you the best possible repair with little out of pocket expenses for you. For more information about our trawler boat repair services, contact Anchor Marine Repair today at 763-972-3540.